Ashley always knew she wanted to work in the veterinary field ever since she was a little girl. Her father is a veterinarian which inspired her to want to work with animals. She grew up watching her dad help animals and knew that she wanted to follow in his footsteps. She really enjoys helping animals feel better and recover quickly. Ashley was born in Chicago, IL, but raised in Muskego, WI with her brother and sister. Her father owned a veterinary practice in Chicago so he commuted and they spent summers and weekends in Chicago. Ashley started in 2005 in a day practice and was trained as an Assistant. 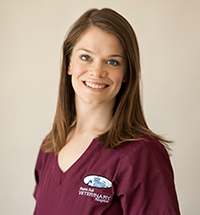 She has worked in day practices as well as emergency clinics. She loved the business side which is why she attended WCTC for business management and was part of the National Technical Honor Society. She spent four years working in the HR Department of a corporate office but realized that her heart was really in veterinary medicine and wanted to return to the field and use her management skills. Ashley is engaged and has a 6 year old daughter and a 3 year old son. They have a dog named Jaxson and a cat named Meowsers. In her spare time she enjoys boating, jet skiing and spending time on the lake. We are a Franksville based veterinary hospital providing full service medical care, wellness checkups, and nutrition and weight management.